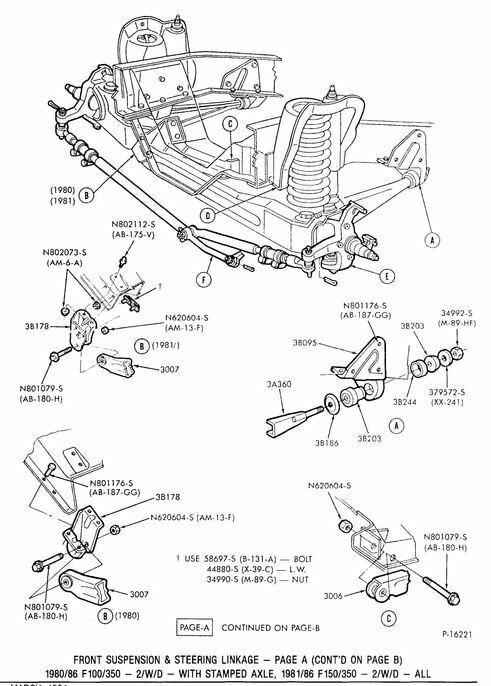 Illustrations & part numbers for the front suspension on Ford's 1980 - 86 trucks. 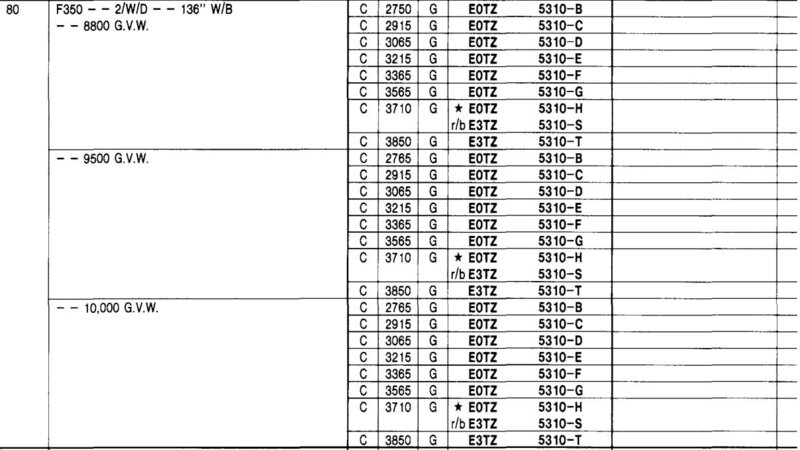 It is a very complex issue to find the part #'s for front suspensions as you must have the Ford I.D. 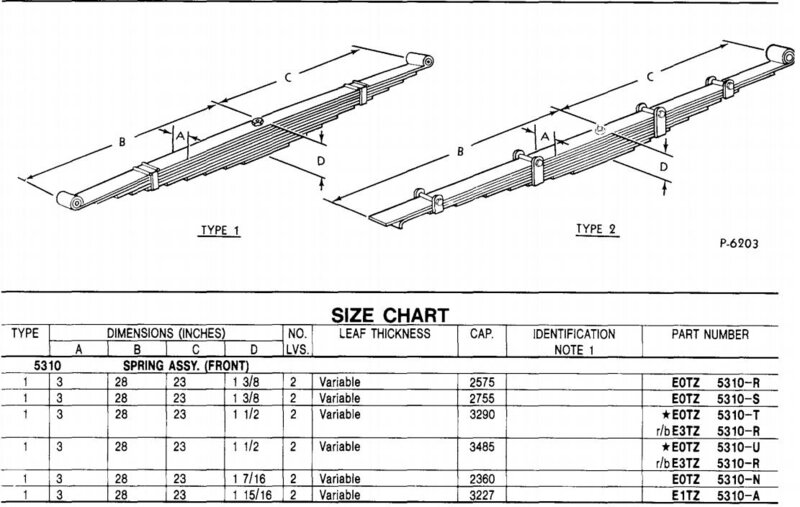 No for the axle in order to find parts list number for your specific axle out of a 7-page table that starts like the one shown below. 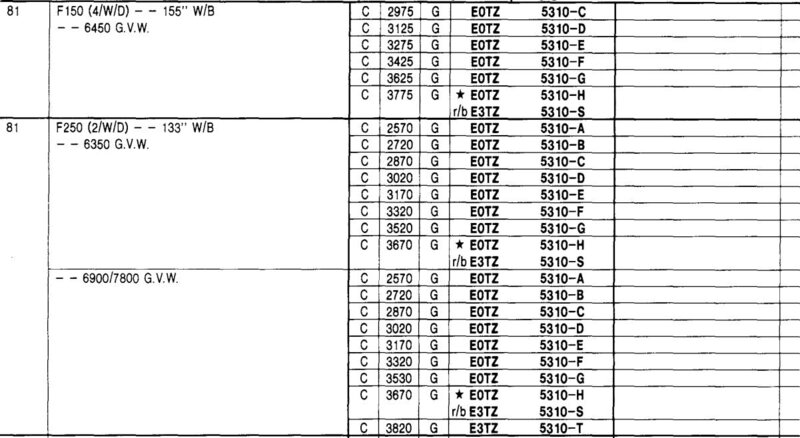 As an example, I've highlighted axle E0TA-EF, and that it has parts list number 30.3B. 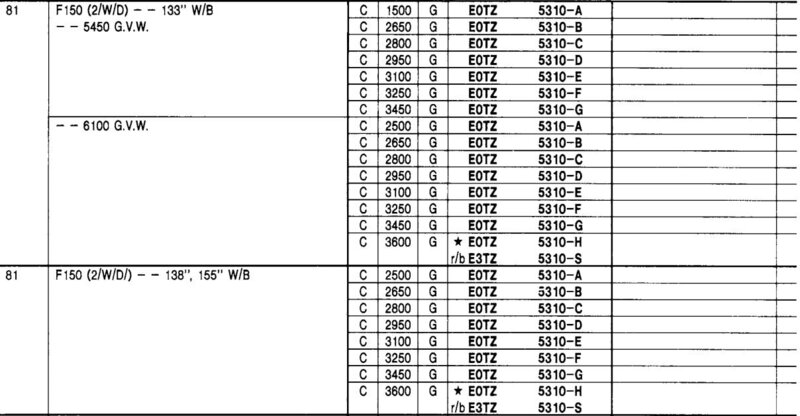 Then, once you have the parts list number, you can turn to the parts lists that look like the one below. 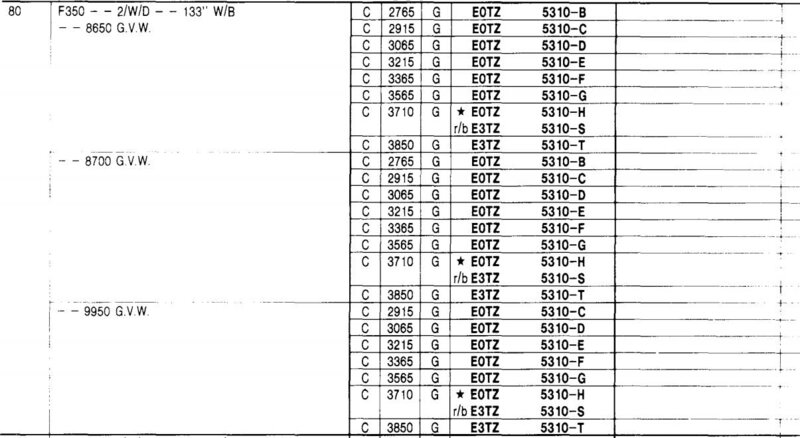 In our example you go to Parts List # 30.3 and then down Column B, for 30.3B. 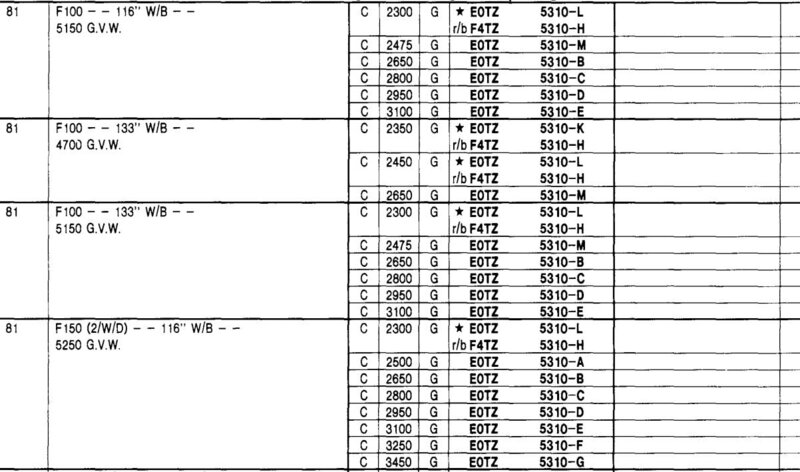 But there are 6 pages per range, like the A to M range shown below, and that's just for the Dana 44 axle. 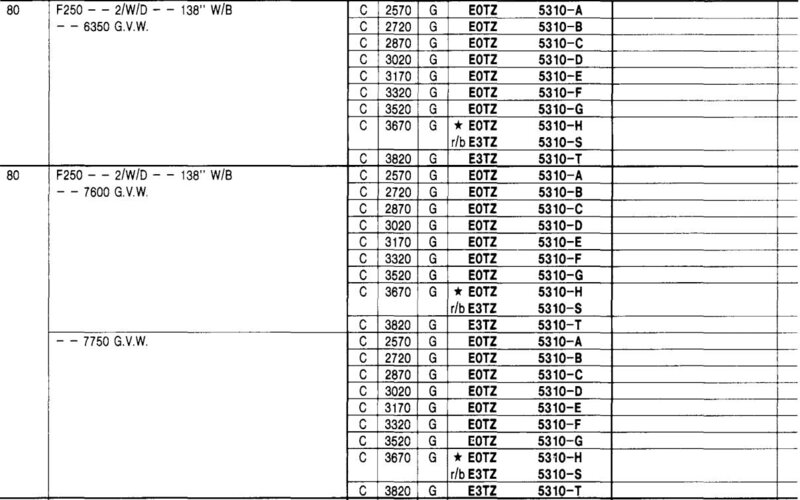 So posting that info would take too much time. 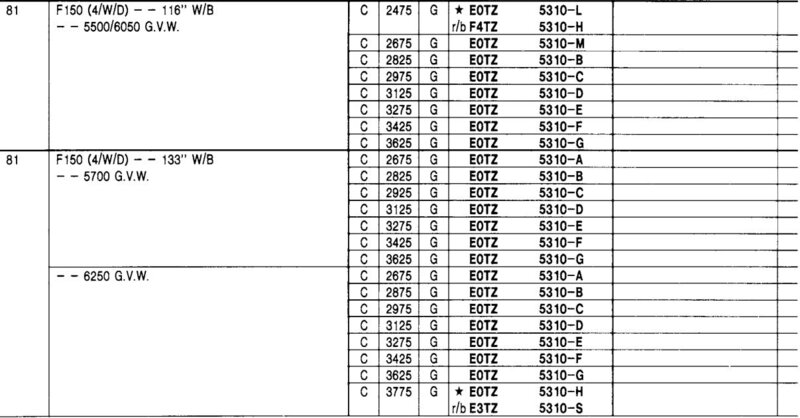 However, if you have the number for your axle, like E0TA-EF in the example, then I can look it up for you. 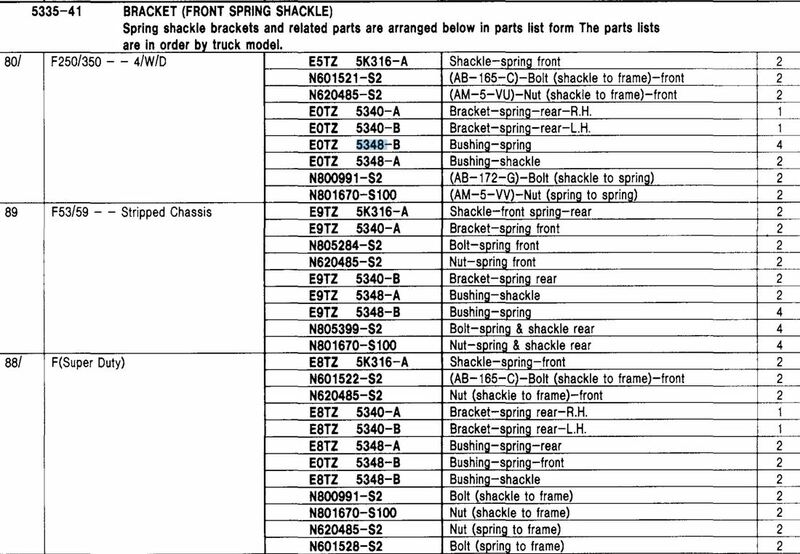 The following are the entries in the Master Parts Catalog for the front springs on the Bullnose trucks. 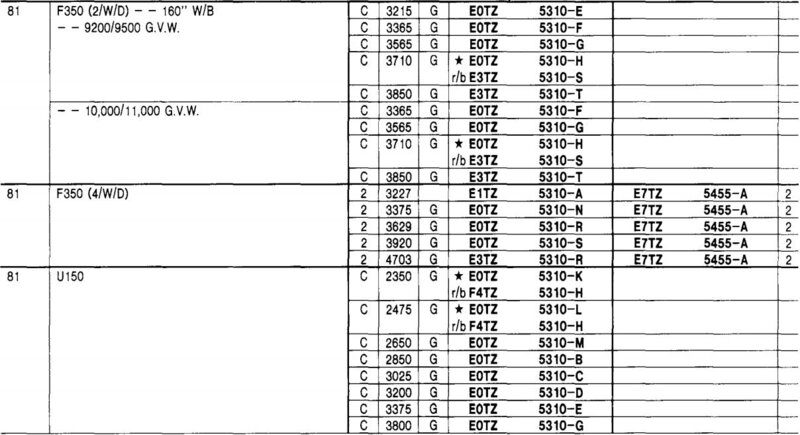 I've split the info across two tabs because as of March 13th, 1981 things changed significantly in the catalog listings. 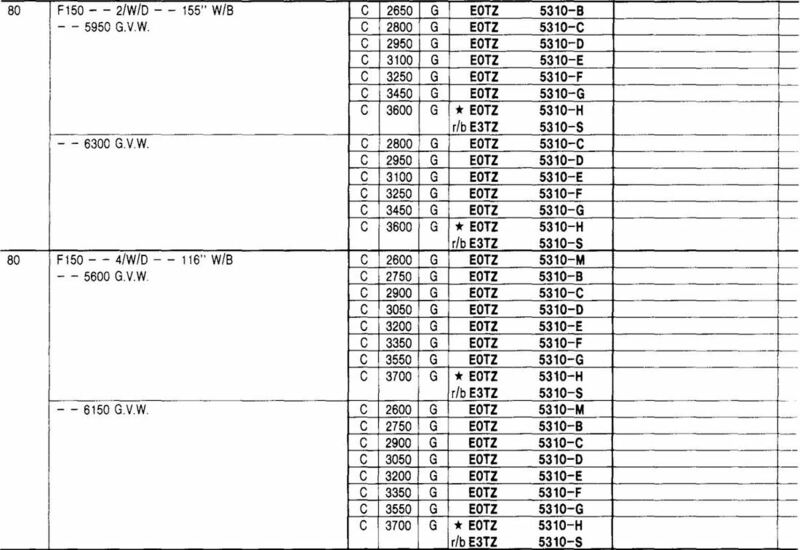 Prior to that date Ford put the GVW of the truck and the capacity of the spring in the catalog for a really long set of entries since several of the GVW's shared the same spring. 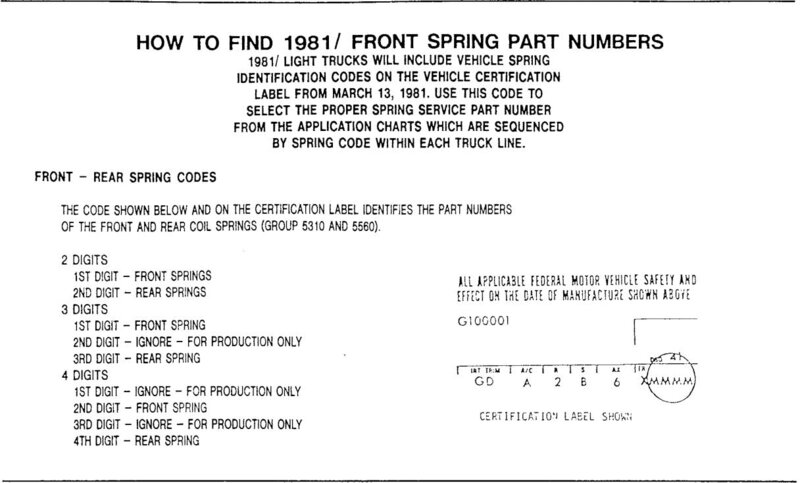 But after that date they put spring code that is on the the certification label in the catalog along with the part number for the spring. 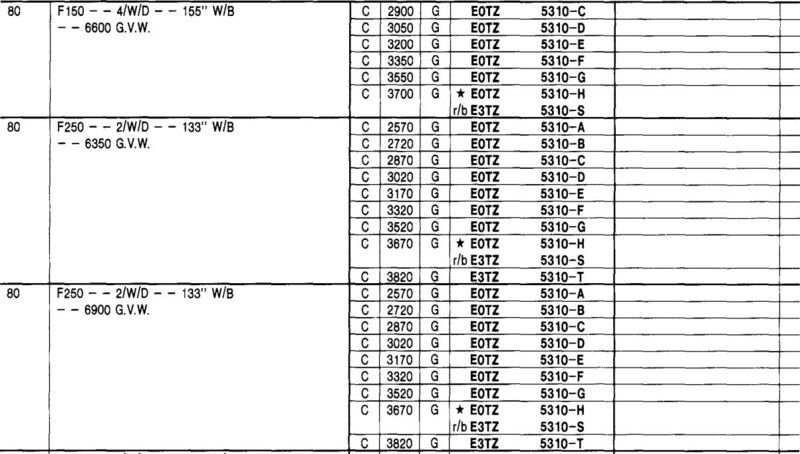 That make a much shorter set of entries, but it may leave you wondering what the capacity is of a particular spring. 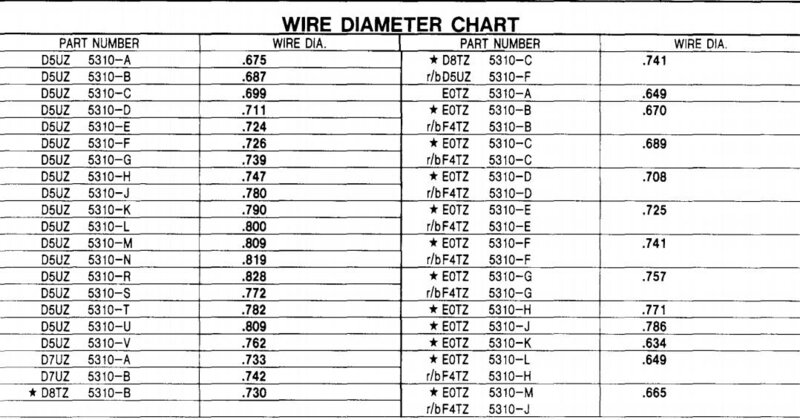 Not to worry, most of the springs used after March 13th 1981 had also been used prior to that date, so if you take your part number to the "prior" tab you should be able to find the rating. 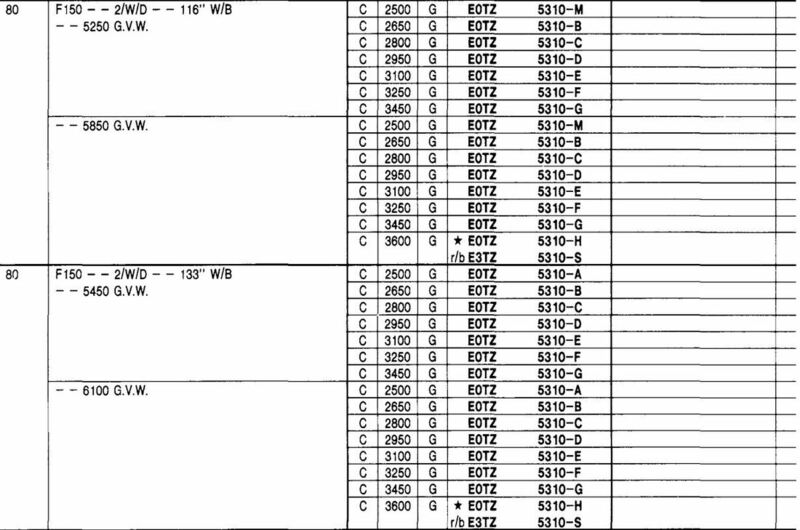 But, even better, I'm slowly typing the spring capacities into the chart on the Cross Reference Chart tab. 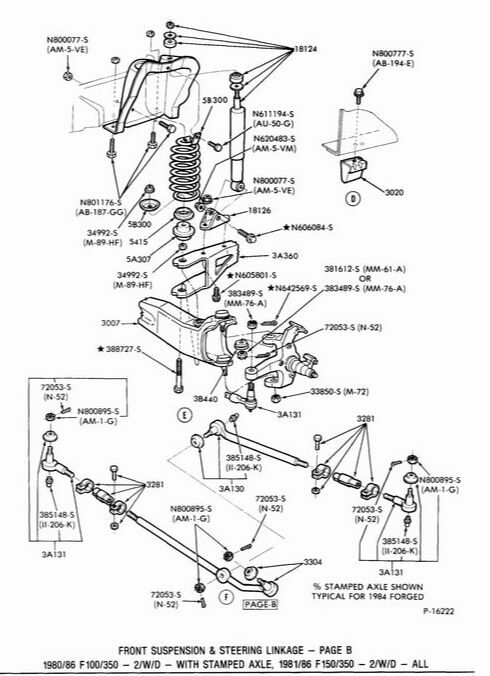 I had quite a struggle figuring out what parts went where in the front suspension of Dad's 1981 F150 4WD with dual shocks and a sway bar. But I finally figured it out and thought I'd record here what I found. 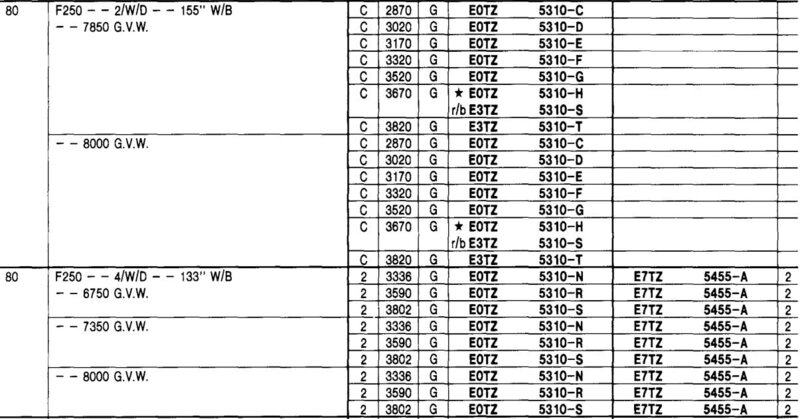 Here the three are from right to left: lower coil spring retainer E0TZ 3B186-AA; front radius arm bushing retain E0TZ 5B300-A; and rear radius arm bushing retainer 379572.